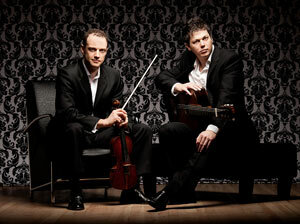 " Duo Rendezvous plays music that invites you to close your eyes and open your mind, let images just happen and follow, and should you ever get a chance to see them, I suggest you do just that. 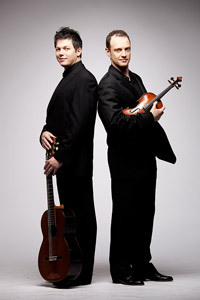 Duo Rendezvous is already in great demand by presenters across the country, thanks to the thriving solo careers of the two performers and to their reputation as charismatic virtuosi who enjoy engaging their audiences with humor and passionate musicianship. 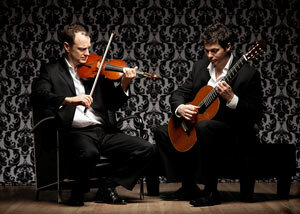 Their unique programming enriches the existing guitar and violin repertoire with transcriptions of masterpieces from around the world and newly commissioned pieces by leading Canadian composers. Suite 220, Toronto, ON Canada, M5V 3A8. Copyright © 2017 Duo Rendezvous. All rights reserved.